Born July 12, 1927 in Dallas, Texas. Elliot M. See, Jr. received a bachelor of science degree from the U. S. Merchant Marine Academy and a master of science degree in engineering from the University of California, Los Angeles. See and his wife, Marilyn Denahy See, have three children, Sally, Carolyn and David. See served as a Naval Aviator from 1953 to 1956. He became a test pilot and logged over 3,900 hours of flying time, including 3,200 hours in jet aircraft. 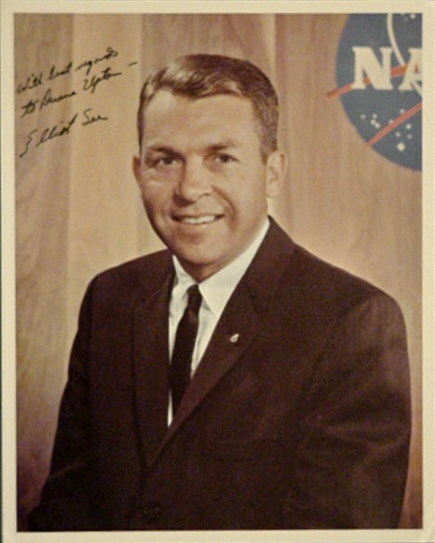 Elliot See was one of nine pilot astronauts selected in September 1962. Following rigorous training he was named the command pilot for the Gemini 9 mission. While in training for this mission he was on a flight into the McDonnell Aircraft Corporation’s St. Louis plant. During an instrument landing the plane crashed. Elliot M. See, Jr. made the ultimate sacrifice and lost his life in service to the nation and the space program on February 28, 1966 at 38 years of age.